Film editing is one of the most important departments of film-making. A film is a combination of several art forms, such as music, acting, direction, screenplay, picturization etc. All these art forms are combined together through editing. And that is how, a film is made, on the editing table. A film is made up of emotions. The viewer of a film experiences a range of emotions to an imaginary world on screen. With latest software, tools & techniques, the editor creates emotions, rhythm, structure, pace & timing in a film. An editor can create different kinds of emotions from the same footage by cutting it differently. Sixteen By Nine Media Centre, through this course will train the student to think like a filmmaker with offering, real time project based learning. We train students to develop concepts and not just be a software operator. Training is provided using latest software, Final Cut Pro X, Da Vinci Resolve, Adobe Premiere Pro CC & After Effects, coupled with teaching aesthetics aspects of film-editing. How to watch & study a film? Concept note development, How to source a content? Founder & Director, Sixteen By Nine Media Centre. Starts in June, 2019. Date to be announced. Class Time: 10 a.m. to 1 p.m. This course trains the student to become a Professional Film Editor along with offering 1 month internship. With expertise in industry standard software & techniques for film-editing, coupled with knowledge in aesthetic aspects of film-making, the student becomes professionally ready to work as an independent Film Editor in the film & television industry. 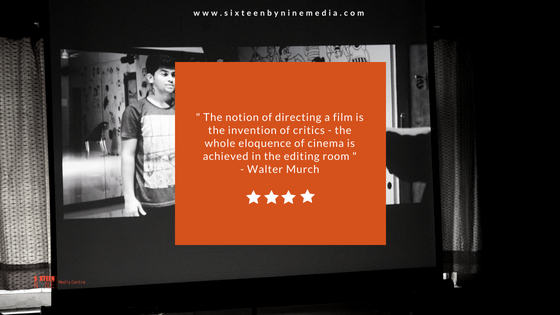 Why choose Sixteen By Nine Media Centre? Well equipped lab & classroom with 1:1 computer to student ratio. Industry-oriented course, covering wide ranging aesthetic, operational & technical aspects of non-linear editing. Exhaustive training in professional industry - leading non - linear editing systems (Final Cut PRO X & Adobe Premiere CC). Recognised facilitators and resource person strained from the Film & Television Institute of India (F.T.I.I. ), Pune. 100% placement assistance in Production Houses , Channels , NGOs. & Corporate Organisations in Mumbai and Pune. An ideal and convenient location in the heart of Pune city. Month 1: Introduction to film editing, How to watch & study a film, Iconic edited scenes, Video formats, 12 shot exercise, Concept note development, Non fiction project. Month 2: How to source a content, Story: origin & genesis, Fiction project, Dubbing & syncing, Fiction project, Color correction & color grading. Month 3: Story structure diagram, Sound theory, Audio editing practicals, Movie trailer editing, Shot division format. Month 4: Music video editing, Ad film analysis, Ad film editing, Movie audience consumer behaviour. Month 5: Introduction to vfx, Matte painting & composition, Chroma keying & motion tracking, Cloning, puppet tools, tips & tricks. Month 6: Building up show reel. - photocopy of mark sheet of any 1 of the examinations - S.S.C. / H.S.C. / Graduation / P.G. - Payment through credit & debit card can be done using the link button given in our website on the respective course information page. - Payment can be made through drawing cheque in favour of, "Sixteen By Nine Media Productions"
Submission of post dated cheque is mandatory in case of opting installment plan. Inability to pay fees on time will lead to cancellation of admission. Fees once paid is non-refundable under any circumstances. Sixteen By Nine Media Centre holds the right to grant as well as cancellation of an admission. SBNMC reserves the right to use a student's name, photograph, testimonials, likeness or films in brochures, ads, web & any other promotional material or educational purpose.